A few months ago, we were in town, and had lunch at the superb Trinity Kitchen. For those unfamiliar with the mighty city of Leeds, Trinity Kitchen is the food court attached to its big, shiny shopping centre. At this point, I’d expect most people with an ounce of self-respect to run screaming from any recommendation to eat in a shopping centre food court, but this one has a little trick up its sleeve in the form of a huge vehicle hoist and a big door in the wall, through which a revolving cast of street food vans are driven each month. The set list changes all the time, showcasing the very best in British street food, and it really is something. On this particular visit, there was a van there that had trundled up from London. How it got to Leeds, I do not know, but it was there, and it was pushing Korean burgers – big patties of just slightly rare ground beef, served in a brioche bun and covered in kimchi. The boy and I had one each, went home, and started to make kimchi immediately. It was familiar, but so entirely different, a burger with an otherworldly touch. Leeds is a city that can knock out a decent burger or two, but these were off-the-scale good. There’s a looseness and playfulness about Korean food that makes it really attractive to the home cook. The rules are there to be flexed, bent, and smashed to pieces, and nobody Korean will care. Don’t have exactly the right variety of cabbage to ferment in your kimchi? Doesn’t matter. Chuck in whatever you’ve got, and anything else that’s left over in the fridge, just remember the chilli, OK? Korean cuisine has always been good at adopting and adapting, and western food fads have been taken up with relish over the years. What we’d call ‘fusion food’ is typical – Western methods and techniques sneaking in every now and again, up against Korean flavours and tastes. Typical of this is the recent influx of French-style bakeries, in a country that doesn’t really have a tradition of bread making. It’s a wonderful thing, lacking the fussiness and precision of classical Chinese or Japanese food, and injecting a whole lot more fun into the mix. 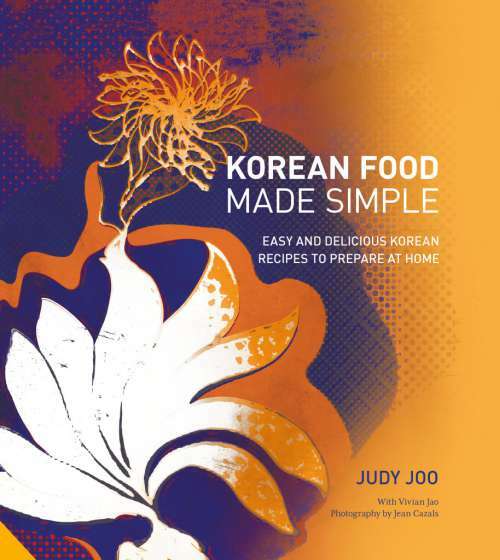 Judy Joo’s Korean Food Made Simple is an excellent introduction. A TV tie in, but don’t let that put you off, it covers the backbone of Korean food in a simple, straightforward, no-fuss way, with recipes that are accessible and clear. As with any type of Asian cooking, a fair number of, shall we say, more esoteric ingredients are necessary, but nothing that a trip to a decent far eastern focussed store, or even a really big supermarket, won’t provide. That aside, there’s plenty to cook here that requires little more than the stuff that you’ve probably got in your cupboard or fridge already. Let’s take a simple example – grilled hanger steak. Soy sauce, sesame oil, garlic, ginger, shallots, pepper, spring onions, sesame seeds. Grilled steak, Korean twist. Done. Other recipes are more complex, obviously, but each is set out in a clear and unfussy way. Joo has a knack for balancing her enthusiasm for Korean food with a clarity and simplicity that will help people to actually cook it. There are many challenges here, many things to get stuck into. The first thing to do if you’re going to jump into the world of Korean food is to master the art of making kimchi. This standard stand-by of fermented vegetables, usually with cabbage of some sort at the centre, is the basis of a good deal of Korean food. It’s the signature flavour, that fizz and tang of sourness, followed by a kick of heat. It’s easy to make, and worth the small effort it takes. I’ve got to say that I’m a convert. That burger in Trinity Kitchen, and Joo’s accessible and comprehensive book have turned my head. There’ll be more Korean food on here, for certain. As an introduction, Korean Food Made Simple is first-rate, as a jumping off point into an exciting, different, and entertaining cuisine, it’s perfect.